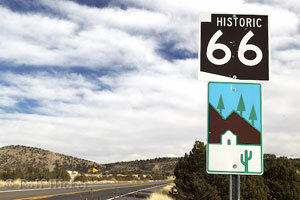 Formerly the only road west, Route 66 is now more of a memory than a journey, but the route will always remain the most revered two lane road in America. 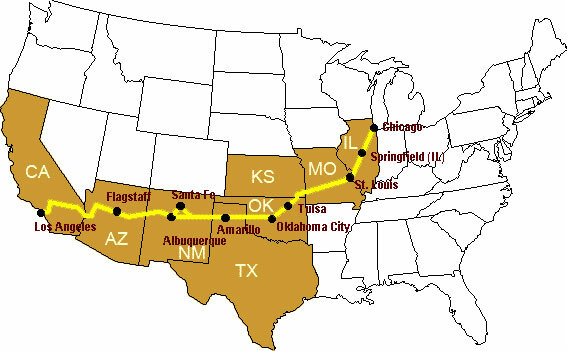 Route 66 gained historical status in 1988 and since then its popularity has skyrocketed as its importance to America’s western development is more widely recognized. In Arizona, where you can vacation any season of the year, the stretch of the original “Mother Road” might be the most picturesque along the entire Route 66. From the lush, green forests and historic buildings to the 50,000 year old meteor crater, northern Arizona’s piece of Route 66 is packed full of nostalgic, natural and cultural experiences. Some visitors, believing the “Mother Road” should be done slowly, taking time to savor the sites and sounds, set aside months to drive the entire length. View highlights and photos of a short, three day exploration around Flagstaff, Arizona — enjoy as we did. Williams is headquarters of the Kaibab National Forest: it has 7 lakes & reservoirs that carry trout + other fish, and has produced state, national & world records for hunters of elk, mule deer and pronghorn antelope. and have our dessert at Twisters go, the 50’s style soda shop. Founded 1894 by Percival Lowell, the observatory is active in research; visitors come year-round to browse exhibits and explore the night sky. Movies on the Square go A free event and Flagstaff summer highlight. From May through mid-September on Heritage Square in historic downtown, townsfolk and visitors enjoy live entertainment and a feature film under the stars. Flagstaff, Northern Arizona’s attraction hub, is a destination for all seasons. Surrounded by natural wonders, clean mountain air, alpine forests, and scenic vistas, it has a strong Western legacy rooted in the pioneer ranchers, railroad builders and lumbermen who founded the city. Seekers of adventure, natural beauty, and the peaceful solitude of the American West will find it all in Flagstaff. Stop by famous roadhouse, Museum Club go listed in National register of Historic Places. Rich in country legends and ghost stories, it is Southwest’s largest log cabin. day 3 Flagstaff to Winslow go Drive east to Winslow, a very small community about an hour to the west, made famous by its corner at Second Street and Kinsley Avenue. 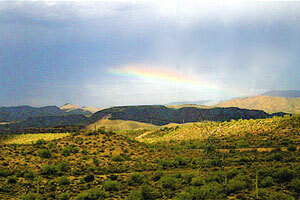 The site, referred to in the song written by Glenn Frey and Jackson Browne became The Eagles first hit single in the 70s. This magnificent property, reminiscent of a Spanish Castle. is the last and most elegant of the great Harvey Houses (railroad hotels) built to serve passenger trains running between Chicago and Los Angeles. Chef John prizes locally grown herbs and vegetables and the finest fresh ingredients are brought in daily. Winslow is in its second year of a three year town revival project. Tour the first year’s accomplishment – a park along the old Sante Fe rail line featuring an ambling path with “Burma Shave” style signs along the way adding unexpected humor to the walkway. On drive back toward Flagstaff we detour to view Meteor Crater go the “Best Preserved Meteorite Impact Site on Earth”. Formed nearly 50,000 years ago by a giant meteor weighing several hundred thousand tons, this crater is 550 ft. deep, 2.4 miles in circumference and nearly one mile across. 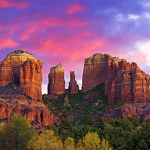 day 4 Flagstaff to Sedona go Drive 27 miles (paved highway) from Flagstaff through spectacular Oak Creek Canyon to Sedona red rock country in central Arizona.